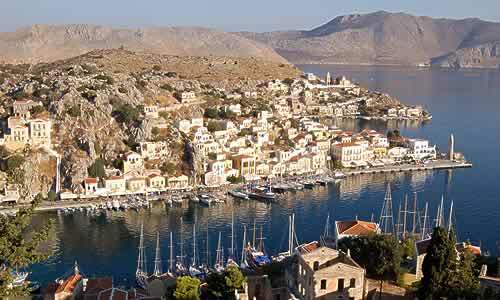 (GREEK NEWS AGENDA) The island of Symi (www.symi.gr) belongs to the group of Dodecanese islands. Though stylish and cosmopolitan, it has managed to remain simple and unspoiled. No modern concrete construction, no high-rise hotels, no villa complexes. Few other islands have Symi’s crisp brightness and its amphitheatre of imposing neo-classical mansions, in traditional shades, stacked one on top of the other up the barren hillside. Sporting the rugged charm of its dry landscape and its breathtaking harbour Gialos, this small, beautiful island has experienced tourism, embraced it, and absorbed it, without letting it harm its charm.